NOTE: This article has been updated for 2013. This year, $4.99 gets you access to the every available MLB Playoff game on TBS or MLB Network. Android, iPhone, and iPad users can get Postseason.tv as part of the MLB At Bat ’13 apps. In previous years, the home plate view seemed to be the best for watching as a stand alone option. I would compare it to watching a game from the stands behind home plate. They’ve also added a mid home plate view that is usually really nice as well. You can choose to watch up to 4 angles at one time. While you do get the TV broadcast audio, you won’t get any replays or graphical overlays displaying stats or other info. And, any time they throw it to the studio for an update, you won’t get to hear or see it. Although it’s disappointing that MLB doesn’t offer a full TV broadcast option online like MLB.tv, $4.99 is a pretty reasonable price to watch 3 playoffs series and Wild Card games, even if it is merely meant to be a supplemental option. In years past, I’ve watched much the ALDS exclusively on Postseason.tv and I found Postseason.tv to be a passable solution for those with no other option. I’ve relied mainly on the “Home Plate” view, which gives you a view from behind home plate and allows you to see the entire field. Watching a game this way actually kind of grows on you after awhile. You can catch some subtitles that you might not catch on a typical broadcast, such as seeing the runners lead off bases, infielder movement, etc. After several games, this ability to view the entire field actually became almost a selling point to me. A real downside is that from the high home plate camera you really can’t get a good view of balls and strikes (just like being at the ballpark). As a companion product, I liked some of the additional camera angles provided. In past years I did have some issues with the broadcast and Postseason.tv being out of sync by a few seconds. Many others, however, reported no such issues. In 2012 however, everything synced up perfectly for me and made for a pretty cool experience. In addition to the 10 camera angles, you’ll get Live batting practice footage, in game highlights, and streaming Tweets. 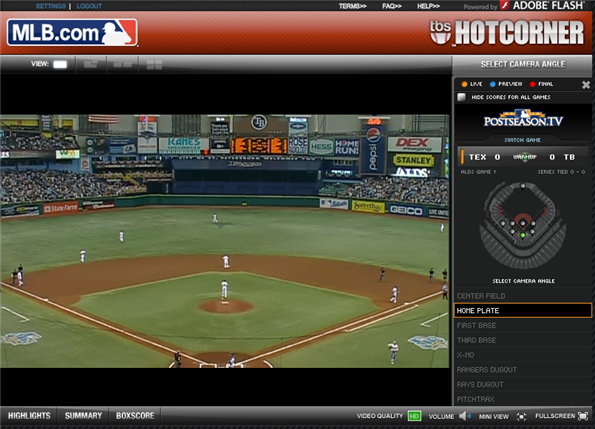 Postseason.tv is available only in the US and Canada and there are no blackout restrictions. MLB.TV Postseason is available to those outside US & Canada for $24.95. We’d love to hear your take on Postseason.tv. Is it an acceptable way to watch a game? How about as a companion to the TV broadcast? Is it worth the money? 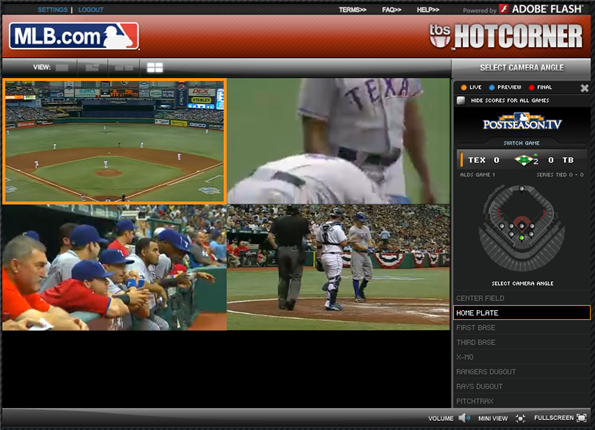 UPDATE (9/9/2012) – I’ve been watching the playoffs exclusively with Postseason.tv on the iPad (MLB At Bat app) and have been quite pleased. It seems to be much improved over previous years. I’ve had no sync issues with the quad view and there seems to more dynamic camera movement from the home plate cameras than in the past. Those cameras (mid and high home plate) also pan out when necessary to show any base runners. I did have issues trying to watch the O’s-Yankees Game 1 over the weekend. I had trouble connecting and when I did connect, I would usually lose the stream within 15 minutes and have to try to re-connect. On all other days, I had no real issues other than the occasional video freezing for a few moments. You can order Postseason.tv for 2013 at MLB.com.